Traveling in Nepal as an overland trip is a fantastic way and tourist bus service gives you a chance to explore the outstanding view of the Himalayas, beautiful landscapes, colorful terraces, rural villages, and local people. There are regular tourist bus booking departure from Kathmandu every day. Overland trip from Kathmandu to Pokhara gives you an amazing experience. We offer the tourist bus tickets on standard Bus and on deluxe Bus. 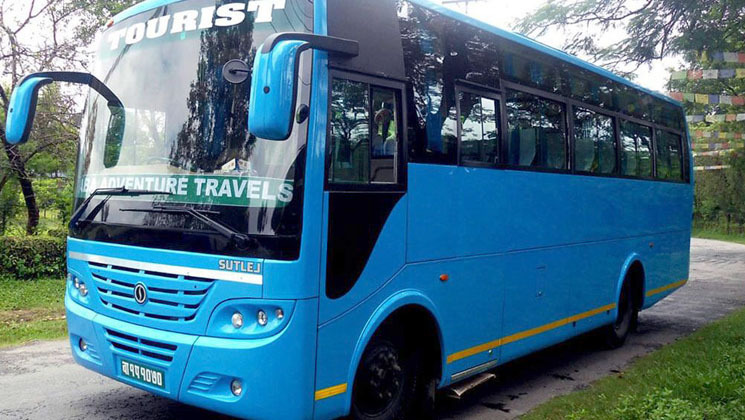 Our standard tourist bus have clean seats and enough spacious rather than other normal tourist buses. So that you can feel comfortable on your journey. The bus driver and helper are friendly – well trained and professional. There are also many Nepali local travelers driving there frequently. Hence, you might not get the tickets easily. So, if you are planning to visit those places, you need to book your tickets in advance to avoid any issues later. We accept multiple payments for the ticket such as cash, bank transfer and Esewa (most popular in Nepal) but we don’t accept credit cards till the next updates. Gokyo Treks & Expedition Pvt. Ltd. offers you the best reasonable and discounted rates on tour bus trips. We have one price one plan system. We can facilitate you on making a reservation on tourist coaches in different parts of Nepal. Please feel free to ask us for city sightseeing more information we are here at your services. Facilities: Air-condition (after Lunch time), Newspaper, WIFI & a bottle of mineral water.